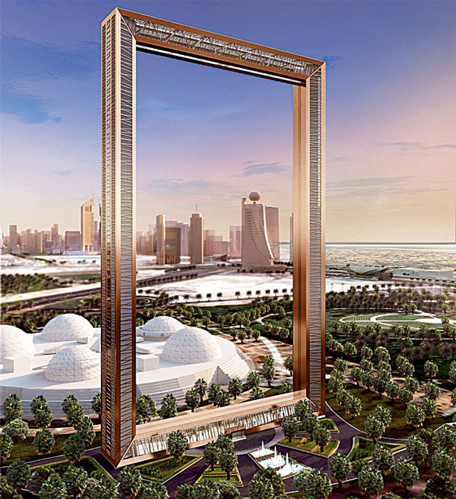 Dubai Frame has been listed among the world’s best new attractions of 2015, according to a UK-based newspaper. The location of the giant rectangular frame is Zabeel Park and was carefully chosen to give visitors the best view of both old and new Dubai, says The Telegraph newspaper, which has listed 13 new attractions to watch out for this year. 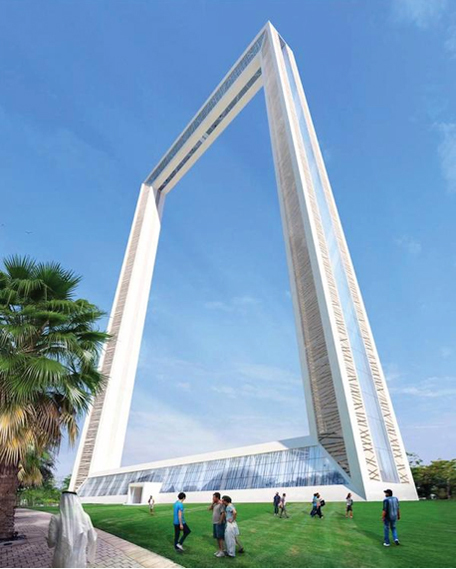 The project comprises a 150-metre-high, 93-metre-wide structure being built to resemble a huge picture frame, through which landmarks representing modern Dubai such as Emirates Towers and Burj Khalifa can be seen on one side, while from the other side, visitors can view older parts of the city such as Deira, Umm Harare and Karama. Dubai Municipality has said the frame is likely to be completed in the second half of this year. Emirates 24|7 has reported that the municipality is planning to launch new projects, aimed at attracting 20 million tourists per year to the emirate in the run-up to the World Expo 2020. Among the 12 other attractions listed are One World Observatory, New York, Grand Egyptian Museum, Giza, Museum of Tomorrow, Rio de Janeiro, Funtasy Island, Indonesia and Eternity Passage, Beijing. Spanning a 120,000 square foot space, the three-level observatory will allow guests to take in panoramic views of the city from 1,250 feet above ground. High-tech features will include lifts, which have three walls of floor-to-ceiling LED televisions, that take you to the top of the building in less than 60 seconds. The main observation level on the 100th floor will feature the Sky Portal, a 14ft-wide circular platform over which visitors can stand for a view of the streets below. It will become one of the world's largest archaeological institutions upon its completion later this year, housing more than 100,000 ancient artifacts, 3,500 of which belong to King Tutankhamen, and covering more than 7,000 years of history. The museum will built over 480,000 square metres of land between the Giza pyramids and Cairo, including the equivalent of four football fields in exhibition space as well as educational facilities, a conservation centre and gardens. It is a 500 metre-long elevated park space and is Sydney's version of New York City's High Line, connecting various neighbourhoods, from Central to Surry Hills, to the south-west corner of the Darling Harbour. Set on Rio de Janeiro's Mauá Pier, the new science museum will cover 30,000 square metres, featuring gardens, a reflection pool, a cycling path and other recreational areas in addition to its two-level museum space for exhibitions, research and educational activities. Said to be the "world's largest eco-theme park", Funtasy Island will be spread over 328 hectares of tropical islands, 16 kilometres from Sentosa Cove on Singapore's Sentosa Island, featuring various entertainment complexes in an unspoilt natural environment. Visitors can access enjoy various activities and facilities, from nature trails, a water park and beach club to land- and water-based safaris, an interactive dolphin habitat and an aquarium swim with sharks. The complex will also include a limited number of villas. China's first "hi-tech amusement park" will be made of 15 individually-themed and uniquely-designed gaming and interactive zones that showcase the country's culture, history and heritage. The 76,000 square metre-park will feature both indoor and outdoor areas, including walkways, bridges as well as 5D and 6D interactive theatres. The park is set about 35km from the city centre and will form part of the Beijing Outlets World complex, which includes a shopping mall, a resort and conference centre.